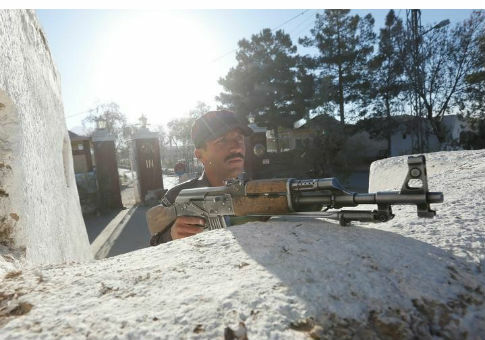 QUETTA/DERA ISMAIL KHAN, Pakistan (Reuters)–A faction of the Pakistani militant group Lashkar-e-Jhangvi (LeJ) cooperated with Islamic State this week in an attack on a police college that killed 63 people, the group's spokesman told Reuters on Wednesday. The confirmation of a link between the two groups will stoke fears that Islamic State, based in Syria and Iraq, is building a presence in Pakistan. Islamic State claimed responsibility for Monday's attack in the city of Quetta and released photographs of the purported gunmen who killed cadets during a raid that lasted nearly five hours. Pakistani authorities, who in September said they had crushed Islamic State's efforts to enter Pakistan, pinned the blame on Al-Alami, a faction of LeJ. Al-Alami spokesman Ali bin Sufyan told Reuters by instant message: "We have no direct link with Daesh [Islamic State], but we have done this attack together." He declined to give specifics, saying only: "We will provide help to anyone who asks against Pakistani security forces, and we will also accept help for this." Provincial government spokesman Anwar-ul-Haq Kakar said the death toll from the attack had risen to 63, and that Islamic State's claim of responsibility was "part of Indian design to malign Pakistan that this terror group has emerged in our soil." Pakistan has previously accused India of fomenting unrest in the province of Baluchistan, of which Quetta is the capital. A spokesman for India's Foreign Ministry said: "We reject this baseless allegation completely." Concern has been growing in Pakistan that Islamic State will seek to exacerbate long-standing sectarian tensions that have flared up in recent years. The Sunni Muslim LeJ has carried out some of the worst sectarian attacks in Pakistan‘s history, including several major bombings in Quetta, and has often targeted the Shi'ite Hazara minority. Analysts have long speculated that Islamic State would strike up a partnership with LeJ, even though the Pakistani group is affiliated with Islamic State's rival, al Qaeda. LeJ has claimed responsibility for a slew of attacks in Pakistan‘s commercial capital Karachi, though officials doubt that all the claims are true. In August, Pakistan announced a 5 million rupee ($48,000) reward for information leading to arrest of Syed Safdar, the head of al-Alami, who goes by the nom de guerre Yousuf Khorasani. General Sher Afgun, a senior military commander in Baluchistan, told media that intercepted calls suggested the gunmen had received orders from across the border in Afghanistan. Afghan officials have consistently denied sheltering anti-Pakistan militants, but the border is not fully under government control. The Quetta attack has also reignited a debate in Pakistan about the need for authorities to target all militant groups, not only those who are actively fighting against the state. Pakistan has for its part been accused of harboring leaders of the Afghan Taliban in Quetta as well as several militant groups opposed to the Indian government, something Islamabad denies. Critics say that, by not stamping out radical groups and their ideologies, Pakistan is making itself a recruiting ground for Islamist militants. "It may not be far off the mark to assume that militants in the country have assistance from across the borders. But this cannot change the fact that they essentially have roots within our own soil and that these have grown over the decades," The News, an English-language newspaper, said in an editorial. Dawn, another English-language newspaper, said: "Blaming sanctuaries across the border or even foreign support is a political game when strong action is called for." This entry was posted in National Security and tagged Afghanistan, ISIS, Islamic State, Pakistan, Terrorism. Bookmark the permalink.